Tarpon! Yup – who doesn’t love having shots at the Silver King. Thankfully, Tampa Bay is at the epicenter of the yearly migration of these epic fighters and is also home to a resident population. When it’s Tarpon time, anglers of all niche specialties have ample opportunities to land one on their favorite gear. This can be heavy tackle, (relatively) light tackle, and on the fly. Known for their acrobatics, viscous runs, and monstrous sizes – this species draws in anglers from all over the world. During Tarpon season it is nearly impossible to get an open spot on a charter, this is a “reserve ahead” fishing trip. Tarpon (AKA Silver King) are one of the most targeted gamefish in Florida and people from all over the world come to catch Tarpon. Tarpon are a very warm blooded fish and typically are targeted in the warmer months of the year. 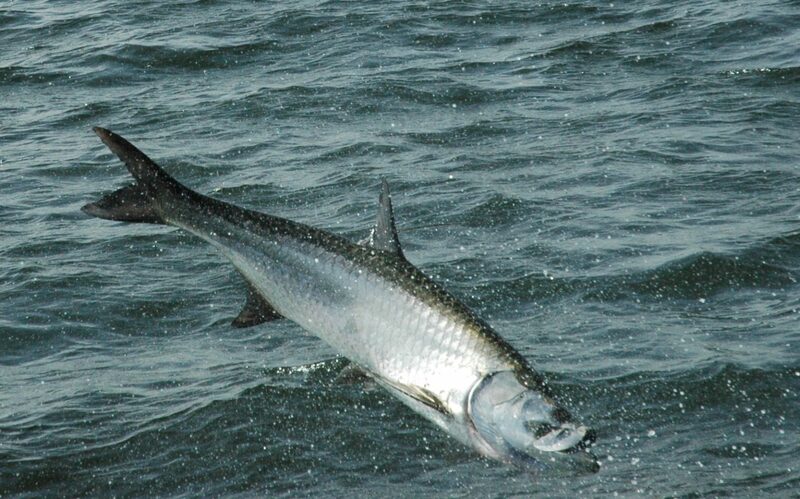 You will find Tarpon migrating the entire west coast of Florida every year by the thousands. Sizes for Tarpon range from 5 lbs all the way up to 220lbs. During the months of May and June we typically find the migration fish milling around the beaches in big schools. You will also find these same fish dropping off into the deeper passes as they look for food. Different types of bait for Tarpon consist of Pass Crabs, Mullet, Threadfin Herring, Shad and many others. Dead cut bait is another very successful way to catch Tarpon as they love dead bait on the bottom. During the later months of the summer smaller juvenile Tarpon move into Tampa Bay and use its river systems as home. These areas are rich with plenty of bait and also give refuge from predators. Tarpon while are a Big game fish are catch and release only and offer no value to eat. Tampa Bay fishing charters In 2018 is off to a great start!